Hi Guys! I hope you all are doing well. Welcome back to my blog.. And those who’re new, I am so glad that they’re here. I appreciate your time and I will make it worth. Have a look on my blogposts and I assure you that your valuable time will not be wasted. We are in the fourth month of 2017 and let’s see what my year planner has got to teach me for April..
Woww…! No matter how much I appreciate this quote, I can never do justice with it. It’s so so so inspiring and absolutely true. Hard work definitely pays off. And this is what has motivated me to work even harder to take my blog to greater and greater heights. 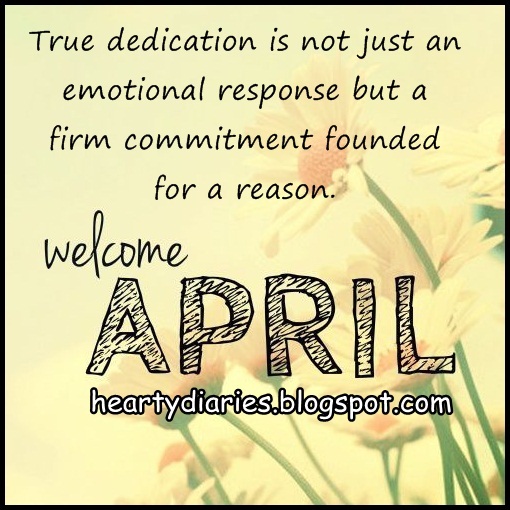 True dedication is not just an emotional response but a firm commitment founded for a reason. Now this one makes me even more and more determined to be more consistent on my blog and with this I have decided one thing.. I have now planned (actually committed to myself) to post thrice a week now. Till now I only posted on Wednesdays and Saturdays. I am really happy to share with you all that now I’ll be regularly posting much better content on every Monday, Wednesday and Saturday. I don’t know how it’s going to work for me. I don’t know whether it’ll be great to execute this plan or i’ll get really caught up in this. Let’s see.. So I have planned to post DIYs, How To(s) or Tips and Tricks every Monday, Product Reviews or Hauls every Wednesday and Home Remedies, Face Masks and all natural treatments every Saturday. Tell me what do you guys think of this new schedule? Do share your plans for this month. Are you excited for another month’s journey or not? I completely am!! Do let me know if you want me to review any product or share some DIY with you.. Till then, BYE!! Take care! I’ll see you soon! Have a great month ahead and work harder and harder to achieve what you desire.